It has always been my goal to invite other people to help me write these pages. So I am very happy to introduce Christoph to you, one of the best terrain builders I know and the guy who built the final boards for WTC 2013 with me. Mr. Mennes has asked me to help him fill his Blog. So here it goes. Every year, our gaming club (https://www.facebook.com/groups/Puppeteers) attends a few conventions. I wanted to make a table for this that is easy to transport, original and most of all eye-catching. I have been toying with the idea of making a table that consists of a lot of flying islands for a while now. 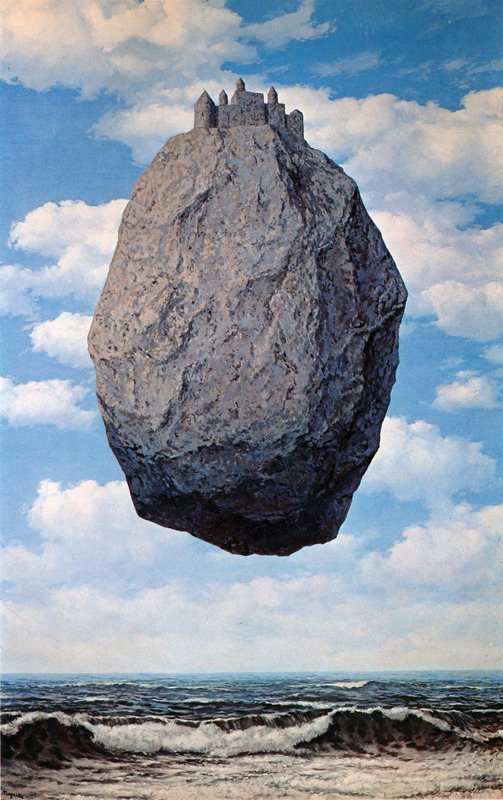 I’ve always been a big fan of René Magritte’s painting “Castle of the Pyrenees”. Nagrand from the World of Warcraft provided some necessary inspiration as well. The plan is to create a big, central island that functions as the big eye-catcher, with some smaller islands floating around it, on which you can play your game. The first thing I had to decide was which game system to build something for. For the project I had in mind, Super Dungeon Explore seemed the perfect choice to me. The atmosphere, the overall design and the fluff make for a very rich world in which just about anything is possible. With the overall theme chosen, I could start working out the different islands. First, I started on the central island. This will be a city. A place where the heroes can come between their adventures to lay low, rest up and gather new supplies. The big inspiration for this city was the Mont Saint-Michel. This city that was built on an island off the coast of France has all the looks of a fantasy town. In the centre of the town, I wanted a small castle. For this, I used elements of the most famous castle in the world. To get a general idea of overall design and atmosphere, I always start by making a few sketches. And then the real work could start. First up: the central castle. Next, the rest of the island, with the first of the houses taking shape. So, that should be it for the building part. Next up: putting some paint on it all.